I use my faux leather backback multiple times a week when I go grocery shopping. It’s so big and handy! But it’s also a very pretty bag, so why not show it to you in this outfit post?! I was wearing my super high waisted tweed-ish pencil skirt, which I bought from Anna Nooshin at the NSMBL super sale. I combined it with a black sweater with a cute lace and pearl collar and added my favorite shoes and beret to finish the look! What do you think? Wow die rok heeft inderdaad een heel hoge taille, wel heel mooi! Leuke rugzak ook, past lekker veel in denk ik! Super leuk! ik ben fan! Wat een mooie rok. Ik vind de hoge taille erg mooi! Wat een leuke outfit! Ik vind de combinatie van een elegante outfit met een edgy rugzak super fashionable! 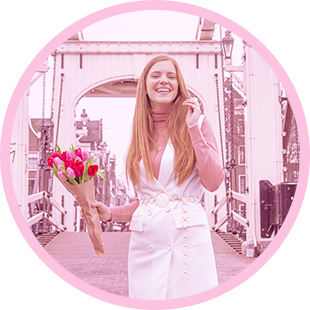 wat een super leuke outfit & wat heb je prachtig haar!